Today’s review is about a television show called Minute to Win It which was once on NBC but is now on Netflix. 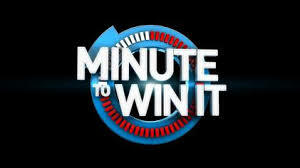 This show is about any person, male or female, who have to do a challenge in 60 seconds or less. The host used to be Guy Fieri until he left when Apolo Ohno took over and it premiered on GSN instead. It is filled with various challenges that are difficult to complete in under 60 seconds, but many people still manage to complete them. When a contestant wins, they receive a price of $1,000,000. The show had year-long spam from 2010-2016. This program aired with three versions of languages: English, Spanish, and Indian. It only broadcasted in four main states, including – United States, Australia, United Kingdom, and India. It has a run time of about 44 minutes without commercials, but with commercials, it’s 60 minutes long. The United States was the first state to air this television program. Many people tend to fail at the challenges because they are just too hard to pass or because they passed the one minute mark. Therefore, it’s considered incomplete since the challenge was not passed in the limited amount of time contestant’s receive. Depending on how many challenges you passed is the amount of money you could receive. If you don’t pass the current amount of challenges, you will lose all of the money you won and end up going home with nothing. It is very common for people to end up losing all of the money they were set to win because they failed to complete more than half of their challenges in time before the buzzer went off. This lets them and the audience know that the challenge has been marked as incomplete. To end off my review, I enjoy watching these shows for entertainment. If you’re looking for any game shows this is the show you’d be interested in watching.